Drilling holes to let the sap flow out undoubtedly injures a maple tree. New Englanders who ply the sugaring trade say that healthy trees recover from the damage and can produce for decades. Instituting new, more conservative measures than their predecessors used, these woodsmen value the longevity of their trees over quick, careless tapping. Under optimal conditions, a sugar maple (Acer saccharum) can live 150 years or more in U.S. Department of Agriculture plant hardiness zones 3 to 8. Holes drilled into the trunk of the tree disrupt the passage of water and nutrients from the roots to the branches. Since the holes are small and not numerous, the tree can usually reroute the flow without a major problem. Beyond the bark lies the vascular cambium, where cells divide to create the annual growth rings that indicate the tree's age. These will be disturbed at the drilling sites. Permanent stains develop above and below tapholes, either from fungi that have entered there or from substances the tree manufactures to wall off the wounded area. In the past, the stains might have prevented milling the tree for timber when sugaring declined. Now, however, the stains are viewed as giving the wood character, rather than being a defect. When sugaring season ends and spouts are removed, a healthy maple tree compartmentalizes the wound and begins to cover the hole with new tissue. On such a tree, the taphole should be completely covered within one to three years. For trees that were stressed at the time they were tapped or that became infected when disease organisms entered through the hole, the healing process may take several years. Sanitizing a taphole with bleach or folk remedies, such as vodka, will not benefit the tree and might cause further damage. The maple sugaring industry is striving to make the tapping process sustainable, instead of leading to the decline of the trees involved. As a first step, trees less than 12 inches in diameter should not be tapped. Those between 12 and 18 inches thick get one tap. Any tree over 18 inches in diameter may have two taps, and that is the maximum, according to Northern Woodlands magazine. For the least damage, new taps need to be 6 inches above or below old holes and 4 inches to the side. "Health spouts," with a smaller diameter than older models, are less invasive and only sink into the tree to a depth of 1 1/2 inches, rather than the former 2 1/2 inches. When inserting the spouts, drillers must be careful not to split the bark or deeper wood. Sugaring has a short season. Tapholes, only active about four to six weeks a year, must be drilled at precisely the right moment. 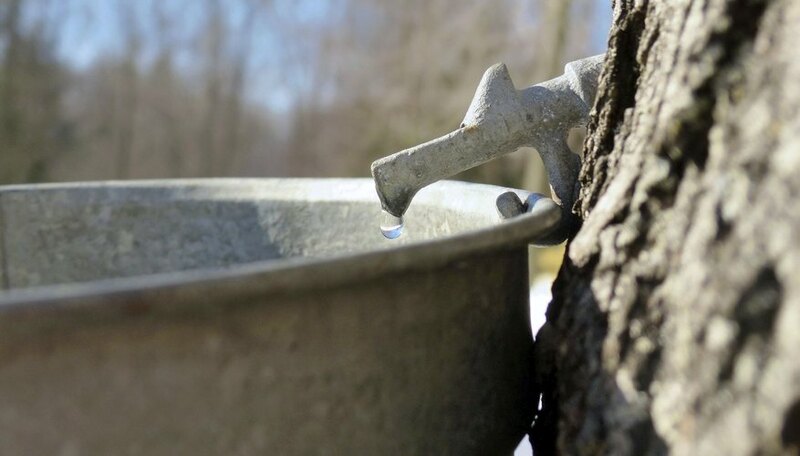 Tapping too early means the taphole may begin drying up while the sap continues to flow. On the other hand, if you tap too late, you may miss productive, early sap runs. The optimal time to drill comes when days averaging 5 to 10 degrees Fahrenheit above freezing are predicted for the foreseeable future. Never tap a tree while the wood is frozen, because the drill does not cut as cleanly. Northern Woodlands: Do We Have to Choose Between Tapping Maples for Sugaring or Growing Them for Timber? University of Vermont Extension: What Does a Taphole Do to a Tree?